Mechanical key switches, a single key life of up to 60 million operations，making it durable and reliable in your game.Not only mechanical key switches, all 35 keys on the keypad are conflict-free. Not just simplify your game operations, but ensure your every command is registered and executed exactly and rapidly. What does it do? It turns blue, green, or... Your V550RGB has an LED multi-color light system, which lets you customize the appearance of V550RGB in many ways as well as to suit your preferences. 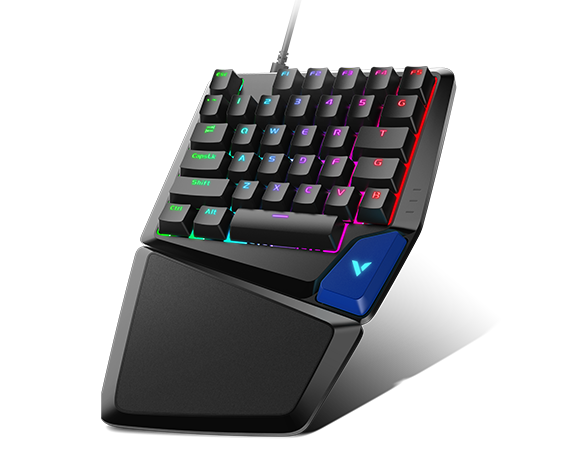 The V550RGB features an APM-lighting mode that reflects your actions per minute with a spectacular light show. Keypad with a detachable plam rest designed for left-handed use, Together they make a formidable combination, prevent unnecessary strain on your hands to enable comfortable grip and pleasant use even during the longest games. Built-in memory can save the keyboard configuration file in the game mode. You can use this configuration on any computer without any software.